A banknote (more commonly known as a bill in the United States and Canada) is a kind of negotiable instrument, a promissory note made by a bank payable to the bearer on demand, used as money, and under many jurisdictions is used as legal tender. 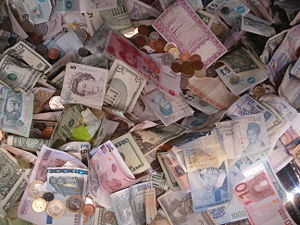 Along with coins, banknotes make up the cash forms of all modern money. With the exception of non-circulating high-value or precious metal commemorative issues, coins are generally used for lower valued monetary units, while banknotes are used for higher values. Originally, the value of money was determined by the intrinsic value of the material the money was made of, such as silver or gold. However, carrying around a lot of precious metal was cumbersome and often dangerous. As an alternative, banknotes would be issued. In financial terms, a note is a promise to pay someone money. Banknotes were originally a promise to pay the bearer an amount of precious metal stored in a vault somewhere. In this way the stored value (usually in gold or silver coins) backing the banknote could transfer ownership in exchange for goods or services. The ability to exchange a note for some other kind of value is called "convertibility". For example a US silver certificate was "payable in silver on demand" from the Treasury until 1965. If a note is payable on demand for a fixed unit, it is said to be fully convertible to that unit. Limited convertibility occurs when there are restrictions in the time, place, manner or amount of exchange. Financial convertibility, where a dollar can be exchanged at the issuing bank for a dollar's worth of the bank's assets. The importance of financial convertibility can be seen by imagining that people in a community one day find themselves with more paper currency than they wish to hold — for example, when the main shopping season has ended. If the paper currency is physically convertible (for one ounce of silver, let us suppose), people will return the unwanted paper currency to the bank in exchange for silver, but the bank could head off this demand for silver by selling some of its own bonds to the public in exchange for its own paper currency. For example, if the community has 100 units of unwanted paper money, and if people intend to redeem the unwanted 100 units for silver at the bank, the bank could simply sell 100 units worth of bonds or other assets in exchange for 100 units of its own paper currency. This will soak up the unwanted paper and head off people's desire to redeem the 100 units for silver. Thus, by conducting this type of open market operation — selling bonds when there is excess currency and buying bonds when there is too little — the bank can maintain the value of the paper currency at one ounce of silver without ever redeeming any paper currency for silver. In fact, this is essentially what all modern central banks do, and the fact that their currencies might be physically inconvertible is made irrelevant by the maintenance of financial convertibility. Note that financial convertibility cannot be maintained unless the bank has sufficient assets to back the currency it has issued. Thus, it is an illusion that any physically inconvertible currency is necessarily also unbacked. Paper money originated in two forms: drafts, which are receipts for value held on account, and "bills", which were issued with a promise to convert at a later date. Money is based on the coming to pre-eminence of some commodity as payment. The oldest monetary basis was for agricultural capital: cattle and grain. In Ancient Mesopotamia, drafts were issued against stored grain as a unit of account. A " drachma" was a weight of grain. Japan's feudal system was based on rice per year – koku. Such drafts were used for giro systems of banking as early as Ptolemaic Egypt in the first century BC. The perception of banknotes as money has evolved over time. Originally, money was based on precious metals. Banknotes were seen as essentially an I.O.U. or promissory note: a promise to pay someone money, but not actual money. As banknotes became more widely used, they became more accepted as equivalent to precious metal. With the gradual removal of precious metals from the monetary system, banknotes evolved to represent fiat money. Generally, a central bank or treasury is solely responsible within a state or currency union for the issue of banknotes. Historically, many different banks or institutions may have issued banknotes in a country. By virtue of the complex constitutional setup in the United Kingdom, two of the union's four constituent countries (Scotland and Northern Ireland) continue to print their own banknotes for domestic circulation, with the UK's central bank (the Bank of England) printing notes which are legal tender in England and Wales, and are also usable as money in the rest of the UK. Banknote collecting, or Notaphily, is a rapidly growing area of numismatics. Although generally not as widespread as coin and stamp collecting, the hobby is increasingly expanding. Prior to the 1990s, currency collecting was a relatively small adjunct to coin collecting, but the practice of currency auctions, combined with larger public awareness of paper money have caused a boom in interest and values of rare banknotes. In the 1950s, Robert Friedberg published the landmark book Paper Money of the United States. Friedberg devised an organizing number system of all types of U.S. banknotes; the system is widely accepted among collectors and dealers to this day, and the volume has been regularly updated. Standard Catalog of World Paper Money: Specialized Issues (10th Ed. Vol. 1) by George S. Cuhaj. Paperback - 1200 pages. (January 2006). Standard Catalog of World Paper Money: General Issues to 1368-1960 (11th Ed. Vol. 2) by George S. Cuhaj (Editor). (December 2006). Standard Catalog of World Paper Money: Modern Issues, 1961-present (12th Ed. Vol. 3) by George S. Cuhaj. (May 2006). For years, the mode of collecting banknotes was through a handful of mail order dealers who issued price lists and catalogs. In the early 1990s, it became more common for rare notes to be sold at various coin and currency shows via auction. The illustrated catalogs and "event nature" of the auction practice seemed to fuel a sharp rise in overall awareness of paper money in the numismatic community. Entire advanced collections are often sold at one time, and to this day single auctions can generate well in excess of $1 million dollars in gross sales. Today, eBay has surpassed auctions in terms of highest volume of sales of banknotes. However, as of 2005, rare banknotes still sell for much less than comparable rare coins. There is wide consensus in the paper money collecting arena that this disparity is diminishing as paper money prices continue to rise at a rapid rate. There are many different organisations and societies around the world for the hobby including the International Banknote Society (IBNS).